Jorge came to GCS as a medical assistant student and has performed in a variety of roles within the company. Jorge is a member of MEDICO, a medical organization that provides general medical care to patients with no access to health services in South America, specifically Honduras and Nicaragua, where he has been a part of multiple medical teams. He is a member of the ONS local chapter, the Advance Practitioner Society for Hematology and Oncology, and serves in several industry-sponsored hematological speakers bureaus and advisory panels. 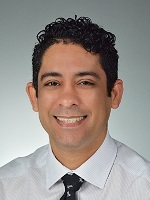 Jorge has special interests in benign hematology and oncology nursing education.